Sony Corporation (hereafter "Sony") announces the development of an attachable Single-Lens Display Module that can turn eyewear of varying designs into smart devices. With this module, Sony has achieved a compactness of size and a lightness of weight that make it possible to attach the module to a piece of eyewear. It accomplished this by equipping the device with a High-Resolution Color OLED Microdisplay, a Micro-Optical Unit that brings out the full potential of the display's high image quality, and a miniaturized control board with arithmetic processing capabilities on par with smartphones that was made possible by high-density packaging technology. This display module possesses the potential to enrich users' lives in a variety of ways. By simply attaching it to a pair of fashionable glasses, goggles, sunglasses, or other type of eyewear, you can instantly gain access to visual information that adds a level of convenience to your everyday life. The module also has potential applications in sports or for work, among other areas, displaying helpful information that supports you in the activity you are engaged in. And this is all done in a small sub-window that does not obstruct your field of vision. Because the module is easily attachable/detachable, you can use it only when you want to, and you have the option to store it away if it does not suit the occasion. Sony's new module presents the opportunity to begin incorporating glasses-style smart devices into your life in a comfortable, easy way. Sony is aiming to start mass production of this display module within the coming year. It is looking to provide the product to a wide variety of potential customers, from eyewear makers whose pieces are tailored for specific uses such as sports or entertainment, to electronics manufacturers who are considering pairing their products with wearable devices, to companies that provide business solutions utilizing wearable devices. By making the product available to such a wide range of outlets, Sony will promote the adoption of wearable devices in new areas, thereby contributing to the further development of the market. Sony will also provide software development kits (SDK) to partnering organizations for this Single-Lens Display Module boasting rich arithmetic processing capabilities, thereby embarking on a new commercial solutions business that will broaden the world of wearable devices. Sony will be unveiling this display module for the first time in public at its booth at the "2015 International Consumer Electronics Show (CES)" to be held in Las Vegas, US from Tuesday, January 6th to Friday, January 9th, 2015. It will be exhibited in the form of a concept model called "SmartEyeglass Attach!," which proposes one potential use for the module and is meant to be attached to sports eyewear pieces. This display module is equipped with a 0.23 inch High-Resolution Color OLED Microdisplay that is among the smallest in the world. It was made possible by Sony's unique OLED and semiconductor silicon drive technologies. While possessing a display measuring 0.23 inches diagonally, it achieves a resolution of 640 x 400 pixels. It is also capable of reproducing deep blacks with contrast ratio higher than 10,000:1 and covering 100% of the sRGB color space, thereby displaying images with rich, vibrant color. With conventional panels, a light shield had to be incorporated into the pixel structure in order to achieve color purity in the RGB stripe matrix. 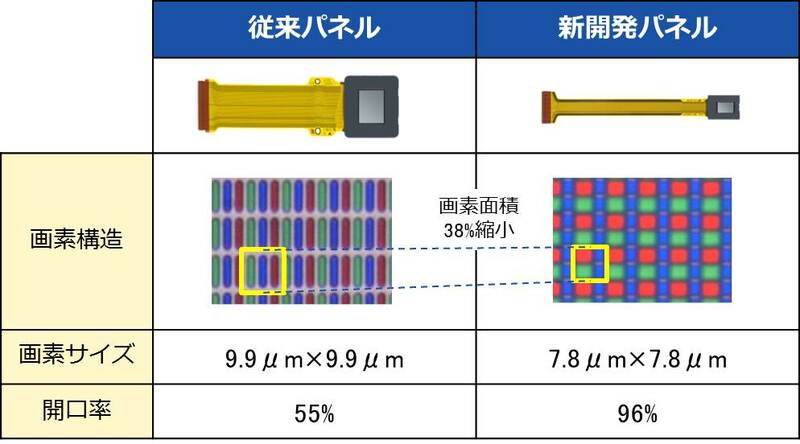 But with the newly developed panel, Sony was able to optimize the matrix arrangement – therefore allowing for a smaller light shield – and miniaturize pixel size while improving the aperture ratio. 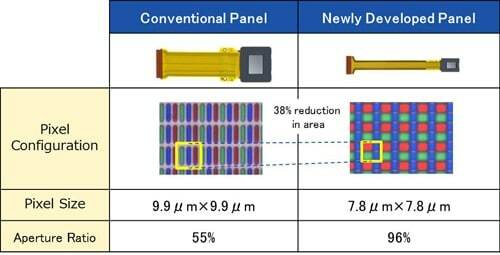 With these advancements, Sony managed to preserve the brightness necessary for use in outdoor conditions while achieving considerable miniaturization in panel size (10.2 mm x 7.9 mm). 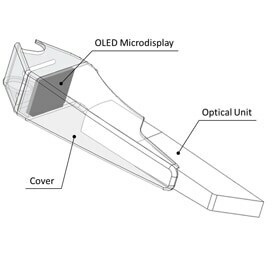 Sony's new display module is also equipped with a Micro-Optical Unit optimized for this OLED Microdisplay, thereby enabling the module to achieve the necessary size and weight. The Micro-Optical Unit contributes to the realization of high quality image projection in any lighting conditions, from a sunny outdoor environment to the dark indoors. The projected image's diagonal angle of view converts to 13 degrees, which is equivalent to the field of view for a 16 inch display 2 meters in the distance. The image size was thus designed to be optimal for use as a sub-window, providing you with necessary information without impeding your view of the real world around you. In addition to its OLED Microdisplay and Micro-Optical Unit, the module is also equipped with a control board loaded with a processor with capabilities on par with smartphones, Wi-Fi functionality, and a variety of sensors. Sony achieved miniaturization of this control board by leveraging its high-density packing technology. The display unit weighs in at around 40 g (22 g for the display arm and 18 g for the secondary arm), a figure that belies the device's advanced functionality. At this light weight, the module places very little additional burden on the user when attached to a piece of eyewear. Sony has therefore achieved a compact form and design that cause essentially no discomfort. Sony is preparing a software development kit (SDK) for this display module in order to facilitate application development. It is thereby moving forward with a glasses-style smart device solutions business that could see the module being adapted to a wide variety of uses, given its high processing power. With the SDK, developers will be able to create dedicated apps tailored to specific uses. They can choose either to load an app onto the module itself, thereby enabling the device to be used independently of any other hardware, or to load an app onto a smartphone, thereby allowing the device to be used in tandem with a smartphone over a wireless connection. 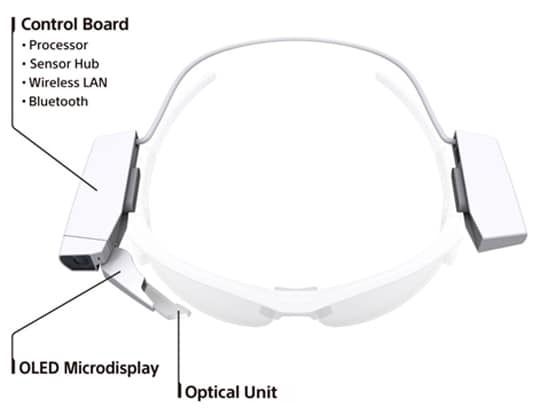 Sony therefore aims to promote development of novel uses for glasses-style smart devices that capitalize on the power of the module's arithmetic unit and Wi-Fi functionality, such as with applications that access data in the cloud or that link with infrastructure systems. Along with the SDK, Sony will also release the display module's communication specifications, enabling developers to wirelessly pair it with a wide range of other devices aside from smartphones. This will make possible a whole new level of potential ways to use the module that could provide users with even greater convenience. Many situations spring to mind in which hands-free display of information would be extremely beneficial. 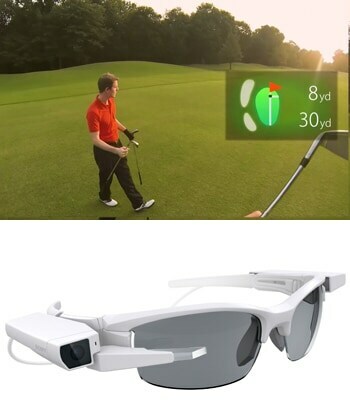 For example, when cycling, playing a round of golf, or engaging in some other outdoor sport, attaching this module to a pair of sports sunglasses and pairing it with a smartphone would enable you to access valuable information such as course maps or distance readings, even when your hands are tied. Using the module for coaching purposes, in concert with an application for sports use, could prove extremely effective as well. Alternatively, the module could be paired directly with an action camera capable of remote display on a smartphone, enabling you to check the angle of view and the captured image from a distance through your eyewear. This would give birth to a completely new style of shooting images and would potentially imbue the camera itself with higher added value. As a final example, Sony has high expectations for the module's applications in a work setting, such as when linked to a factory's internal infrastructure system. Instructions could be given remotely and hands-free, allowing workers to continue their work uninterrupted. *"ARM" and "Cortex" are registered trademarks of ARM Limited (and its subsidiary companies) in the EU and other countries. *All images are of an experimental product and are therefore subject to change.